Hezbollah terror chief likes to keep it 'all in the family,' hiring relatives to protect him on the rare occasions he ventures outside. 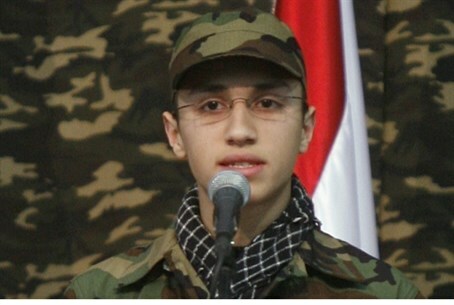 Jihad Mughniyeh, the son of Imad Mughniyeh, who was killed in an Israeli airstrike on a terrorist cell in Syria Monday, was one of the personal bodyguards of Hezbollah's top terrorist Hassan Nasrallah, Israeli sources said. In addition, the sources said that the vehicle that Mughniyeh and his fellow Hezbollah terrorists were riding in had “definitely” entered the Syrian side of the Golan from Lebanon. The sources said that Mughniyeh had been seen in a video taken on December 6, 2011, when Nasrallah emerged from his underground secret bunker for a rare public appearance. Nasrallah has been “off the radar” for years, fearing that the IDF would target him for elimination. During a speech Nasrallah made, Mughniyeh appeared on stage with the Hezbollah terror chief, positioning himself to the rear of Nasrallah – in essence “watching his back” as one of the security staff. Members of the team are personally approved by Nasrallah, the sources said, and all of them are related to Nasrallah either by blood or by marriage. The latter applies to Mughniyeh, whose father, terrorist Imad Mughniyeh, was married to a Nasrallah family member. Imad Mughniyeh himself was instrumental in setting up Nasrallah's security staff, the sources added. In addition to Mughniyeh, another Hezbollah terrorist eliminated in Monday's raid, Muhammad Ali Hassan al-Hassan, was also a member of the security staff, the sources said. Meanwhile, Lebanese sources said Tuesday that the two vehicles targeted by the IAF in the attack – one of which carried Iranian field commander Abu Ali Tabtabai – had left Lebanon hours before they arrived in Quneitra on the Syrian Golan. The purpose of the tour, the sources said, was to allow Tabtabai to review the situation on the border with the purpose of developing new attacks on Israel. On Tuesday, AFP reported that a source in Israel's defense establishment confirmed that Israel had carried out an attack in Syrian territory. Such admissions by Israel are rare. An interview given by an official in the Syrian opposition to CNN Arabic in October said that Jihad Mughniyeh had been appointed “commander of the Golan Heights area” by Hezbollah. Mueid Razlan, a member of the Syrian opposition forces fighting the regime of President Bashar Al-Assad, told CNN at the time that Hezbollah is expanding its operations on the border between Syria and Israel and warned of a possible crisis in the region. Imad Mughniyeh’s death in a car bomb attack in Damascus in February of 2008 has been blamed on Israel, and Hezbollah has promised to avenge his death. Imad Mughniyeh was on the most wanted list of the US for attacks on Israeli and Western targets until his death.